Why Change Your Router Settings? Changing your home router's settings can be a daunting process for some, but in reality most people will be able to do it without having to call that one IT savvy friend or relative, which most families always seem to have (for this article let’s call him 'Gary'). Rest assured, changing the settings on your router is in reality much simpler than many people think, and this guide aims to explain the process. It should be noted however that the settings and options are not the same on every router, and this guide is not intended as a precise instruction manual for all the different routers from the likes of Sky, BT, TalkTalk, Virgin, or Plusnet, but it should broadly apply to most. First off, why change your settings? One of the major reasons to change the default settings on your home broadband router is to improve your security. Security vulnerabilities are being discovered on a daily basis, and routers shipped by ISPs can carry these flaws for a long time, unless a bit of tweaking is done by the user. Changing your Wi-Fi network name (or SSID) for example is a good idea, as the default SSID name (which is broadcast to the world) will give hackers a good idea of the make and model of your router, and thus make it easier to hack. Also, creating a personal SSID that is identifiable to your house, or your family, will help if your Wi-Fi network happens to be clashing with your neighbours Wi-Fi (it can happen with older routers which are trying to broadcast their Wi-Fi network on the same network channel). What router settings should be changed? Besides changing your Wi-Fi (SSID) network name, everyone should change the default admin passwords for their router (usually found on the underside or back of the router itself), but make sure you store the new password in a safe place! Users should also adjust the Wi-Fi security level to utilise stronger encryption, and you should disable WPS due to its inherent security risks. Other settings to change could be parental controls, or creating a guest network for visitors to your home, again to better protect your core home network. There are a number of other router settings that can be set up or modified, but perhaps one of the most important is updating the router's firmware (i.e. its software) to close any potential security holes. The best way to connect your PC or laptop to your home Wi-Fi router is via an Ethernet (nework) cable, or log into its Wi-Fi network. We strongly recommend you connect your PC or laptop to your router via an Ethernet cable, as a physical connection is the most reliable method, and it won't be affected if you make changes to your Wi-Fi network. You can access your router's software (or firmware) via a web browser (Firefox, Chrome, Edge, etc). Any web browser will do. In the address field (usually found at the top next to the padlock symbol), type the IP address of your router. This IP address can usually be found on the router itself (along with the admin ID and password). Typically it is located underneath or on the rear of the router box itself. Most routers use an IP address of 192.168.1.1 or something very similar. But that's not always the case, so check the IP address on the router itself. You are now required to login into your router using the default admin ID and password. Once successfully logged in, you should be presented with a number of settings. Remember, not all routers are the same, but this guide should should broadly apply to most, if not all, home routers. Some routers supplied by ISPs can offer the user simplified controls, typically accessed via a friendlier user interface such as bespoke piece of software from the ISP. Whilst these friendlier options can be useful for the novice to make basic changes, they may not offer all available settings of the router, so it can be better to access your router’s admin controls via the web browser option. The admin password controls access to the router settings, and it's also often set to a very insecure default which can be the same for all routers from that manufacturer, so changing this is the first priority. Use a long (at least 12 characters) and unique passphrase. Admin password settings may be found under a "user management" or "security" menu. Find the Wireless section in the router's web interface, and change the SSID (your Wi-Fi network name). Remember, try to create a Wi-Fi network name that is unique to you and your household, not just PlusnetABC123 or Linksys3456. Do not be tempted to hide your network’s name to keep it secret from other people. Some devices do not properly support hidden networks, but your device can also leak your hidden network name when you are outside your home and make your network less secure. And the reality is that hackers will be easily able to find a hidden network anyway. Once the Wi-Fi network name is changed, locate the Wi-Fi network section and it should allow you to set a new password for your recently renamed Wi-Fi network. As the same time you can set your network encryption setting. Some levels of encryption (i.e. the tech that protects your Wi-Fi network) are stronger than others, and encryption therefore is vitally important to safeguard your network. Your router should display a number of different encryption types such as WEP, WPA, WPA2, or perhaps even WPA3 if the router is very new. Make sure the password type is set to WPA2 or WPA3, and NOT WEP. WEP is insecure and incredibly easy to crack. WEP used to be the standard for securing wireless networks but it has been cracked and is easy to bypass even by entry-level hackers. After WEP came WPA, but this has flaws as well, and has been replaced by WPA2. This still isn't perfect but is one the best available encryption levels for protecting home wireless networks. WPA3 is even better, but only if your router supports it. Once you have decided on your encryption type, enter a strong password (we recommend at least 8 characters that are a combination of letters, numbers and symbols) and apply your settings to safeguard your Wi-Fi network. There may be a section on your router that allows you to apply parental controls, to stop children from accessing unsuitable websites and content. If your router does not have this option you can make use of the free parental controls offered by many broadband providers. Wi-Fi network channel. Wi-Fi networks operate on different channels. Usually this is set to auto (i.e your router decides on the best channel to use) by default. You should really only change this if your Wi-Fi network is regularly clashing with your neighbours Wi-Fi network. Most routers (but not all), if left on auto, tend to work out the best channel. Wi-Fi guest network. Create a guest network for visitors to your home, so they are not accessing your core home network. A guest network is also recommended for use with smart home gadgets so a security flaw in these devices won’t expose your whole network. Firmware updates. Firmware updates are important as they often contain security patches and other fixes for your home broadband router. But follow the instructions carefully when applying firmware, as failure to properly install these could “brick” your router (render it inoperable). Wi-Fi network frequency and dual bands. Some routers can transmit Wi-Fi networks in two different frequency ranges, namely 2.4GHz and 5GHz. In essence, 5GHz provides faster data rates over shorter distances. 2.4GHz on the other hand offers coverage for greater distances, but may perform at slower speeds. 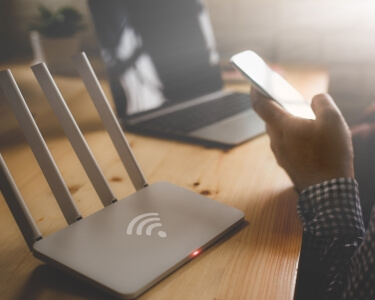 Some devices may only work on a particular frequency, but you can usually enable both at the same time; give them the same SSID and let each device choose the fastest connection. Hopefully all of the above will give you an understanding of how to make some changes (some important, others less so) to your home Wi-Fi router. Tackle the settings you feel comfortable in changing. Otherwise, it may be best to ask Gary to lend a hand! What is a broadband router? Beginner's guide to home broadband routers, a good place to start if you're completely new to this topic. What is Wi-Fi? Learn about wireless networking, including the differences between various Wi-Fi standards. Getting started with Wi-Fi networking. Beginner's guide to setting up a home Wi-Fi network. How to buy your own Wi-Fi router. How and why to replace the free router supplied by your ISP. How to secure a Wi-Fi router. In-depth guide to broadband router security.